Planet Foods News: New Rice at Planet Foods - yum! New Rice at Planet Foods - yum! Wild rice is a great alternative to other side dishes you may have, and tastes great too! Adding wild rice to your diet a deliciously fantastic way to increase the nutritional value of your daily meals. 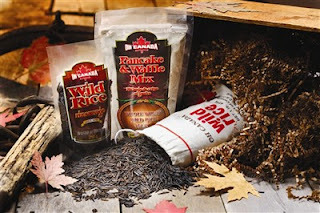 Oh Canada Wild Rice has two sizes of Wild Rice bags as well as a Pancake and Waffle Mix made with stone ground whole wheat, stone ground wild rice, and ground flax. Oh Canada products are made here in Canada and the wild rice is Organic! Canoe Wild Rice is available as a pure uncooked or cooked wild rice, a mix with parboiled long grain brown or white rice, and as a vegetable pilaf. Parboiling rice increases its nutritional value by boiling the rice inside the husk. Posted by Cristy at 1:56 p.m.
Honey Stinger gels are back! Pancakes and Stampede, does it get any better?